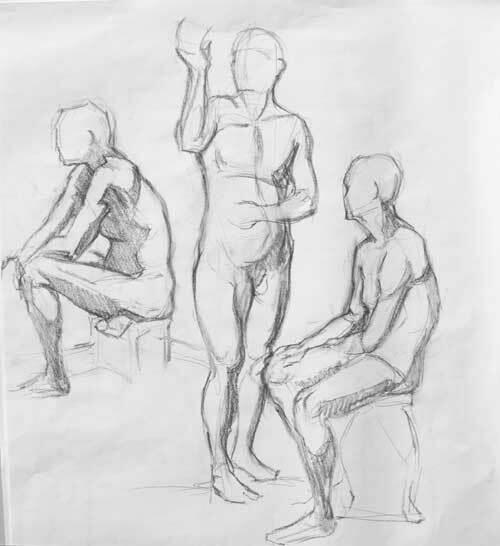 10-minute poses in charcoal on smooth paper. Life drawing can quickly get out of control, with the figure’s head and feet disappearing off the edges of the paper, or a little drawing floating lost in a sea of newsprint. One way I like to corral my drawings is by arranging the figures so that they relate to each other on the page. This forces me to design the perspective (what size should they be for the figures to make sense? ); imagine overlapping forms (correctly layered, the forms will then indicate depth); and practice size and proportion control (no more figures falling off the paper). And I have to do this all on the fly, as the model changes position. I often tell myself stories while I do this. I’m a compulsive story teller (yeah, you say lies, I say plot) and I often create narrative arcs, complete with build up, climax, and denouement, when I’m drawing. That inner literary tension, coupled with the stresses of figure drawing, makes life drawing doubly exciting for me. The drawing below, for example, became a scene from a book the Fiddler and I are enjoying right now, World Without End by Ken Follett. My drawing is not about the main characters, but the faceless prisoners of war that might have been taken during Edward III campaign in France (Yes, I realize those luckless souls were probably not taken alive, but in my story they lived at least bit before they were chopped into bits.) 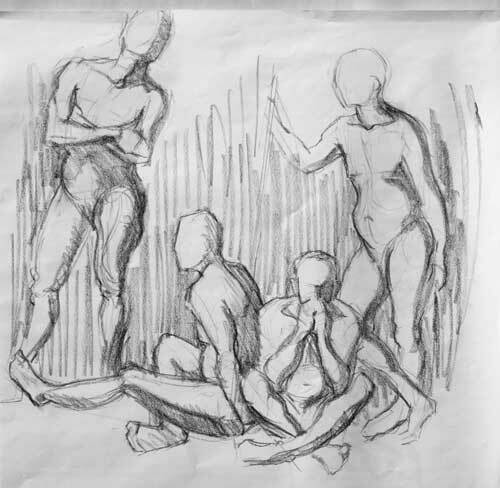 Telling a story entertains me as well as directing the placement of my figures, and the discipline of grouping the figures really improves my life drawing. 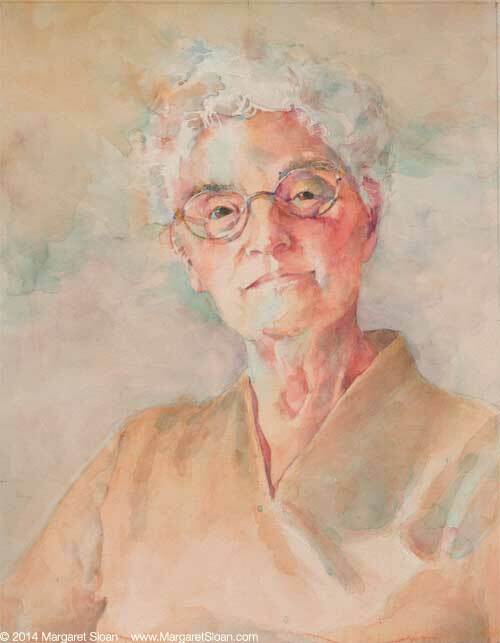 I will be teaching a figure drawing class this Thursday, June 11 at 9:30 – 12:30, at Town Hall Arts/Galerie Copper in Copperopolis in the Central Sierra. We will be studying how the head fits on the torso. All you need is a pad of newsprint and some charcoal (that’s the beauty of drawing), and you can buy those items at Town Hall Arts.